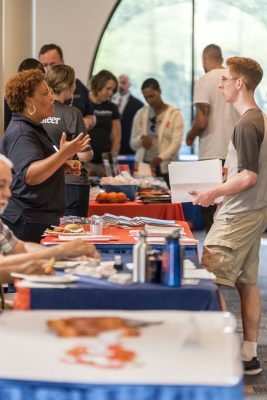 Last Wednesday (Aug. 22), Syracuse University welcomed new student veterans to campus at the annual New Student Veteran Welcome Orientation and Resource Fair. The event provides student veterans, military-connected students and their families the opportunity to connect with other students, learn about campus resources, and meet the dedicated veteran and military-connected support staff. This fall’s 52 new undergraduate student veterans, enrolled on campus, full time, join more than 1,000 other veteran and military-connected students at the graduate and undergraduate levels. The University’s veteran and military-connected enrollment on campus has grown 60 percent since Chancellor Kent Syverud assumed his leadership position in January 2014 and identified veteran service among his strategic initiatives. 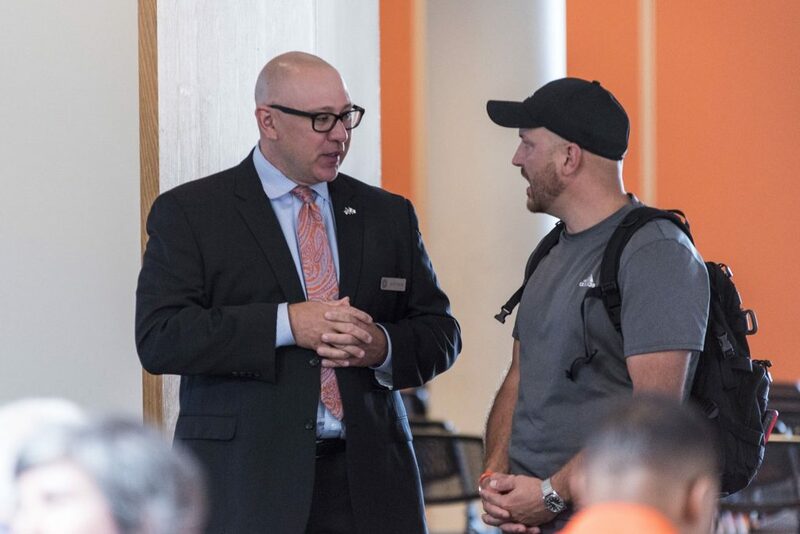 “To grow 60 percent in just four years is truly a testament to the hard work being done around this campus to make Syracuse University the best place for veterans and for our military-connected population,” says Ron Novack, executive director of the Office of Veteran and Military Affairs at Syracuse University (OVMA). increased Air Force and Army ROTC enrollment. Consistently ranked among the top 10 best universities for veterans, SU is also one of only 15 Pat Tillman Foundation University Partners. In its second year as a partner institution, the University was selected for its innovative veteran services and strong culture of support for military veterans and spouses, and its rigorous academic programs. The University is furthering its commitment to the veteran and military-connected population with construction of the National Veterans Resource Center (NVRC), a first-of-its-kind, multi-use facility dedicated to advancing academic research, programming and community-connected innovation serving the social, economic and wellness concerns of the nation’s veterans and families. The NVRC is scheduled open in spring 2020.